The paste that Stephen made up on Sunday to go with our roasted chicken worked really well and I started wondering what else I could use it with. I didn’t get much further than lamb but a craving for salmon today had me wondering whether it would work with that too. While the paste is pretty robust, I thought I’d be OK with the stronger tasting wild salmon and, as luck would have it, Waitrose had two pieces left. I initially thought about serving the salmon with new potatoes but it doesn’i seem warm enough for those yet; puy lentils (with more of the paste stirred through) matched the salmon in earthiness while lemon juice and red-wine vinegar provided the balance. It worked out well, not that you would know that from the picture. Definitely a case of substance over style. Make up the paste by blending plenty of parsley, mint and coriander together with some garlic, oil and lemon zest. Set half aside and use the other half to spread over the salmon. Bake until just cooked through. Take the other half of the paste and let it down with some more olive oil, lemon juice and a splash of red-wine vinegar. Stir this through the hot lentils and leave to cool. 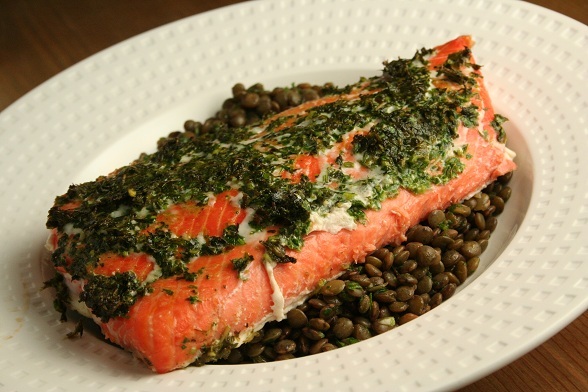 Subscribe to comments with RSS	or TrackBack to 'Roasted Salmon with Herbed Lentils'. .-= LexEat!´s last blog ..The UK’s first Underground Farmers Market (not literally underground, and not actual farmers) =-. .-= gourmet chick´s last blog ..Empress of Sichuan =-. Me too, Lex. There’s something about the oily fish that works really well with the earthy, slightly chewy lentils.